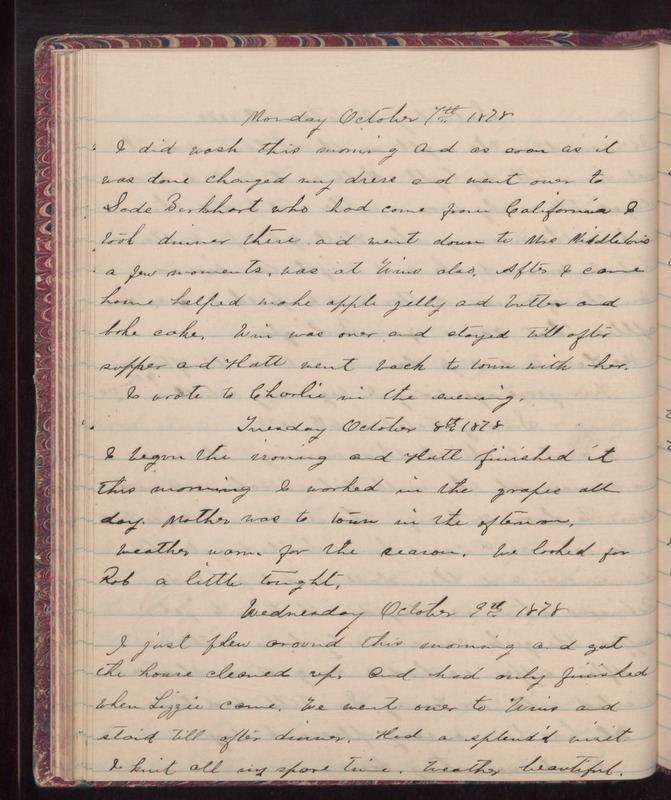 Monday October 7th 1878 I did wash this morning and as soon as it was done changed my dress and went over to Sade Burkhart who had come from California. I took dinner there and went down to Mrs Middletons a few moments. Was at Wins also. After I came home helped make apple jelly and butter and bake cake. Win was over and stayed till after supper and Hatt went back to town with her. I wrote to Charlie in the evening. Tuesday October 8th 1878 I began the ironing and Hatt finished it this morning. I worked in the grapes all day. Mother was to town in the afternoon. Weather warm for the season. We looked for Rob a little tonight. Wednesday October 9th 1878 I just flew around this morning and got the house cleaned up. And had only finished when Lizzie came. We went over to Wins and staid till after dinner. had a splendid visit. I knit all my spare time. Weather beautiful.